A group of TDs who are seeking to amend the Regulation of Termination of Pregnancy Bill to have an ultrasound performed on women undergoing a termination have been accused of being "misogynistic". Solidarity People-Before-Profit TD Ruth Coppinger said those tabling the amendment at the Oireachtas Select Committee on Health wanted women to be "forced to have ultrasounds." She said the only impact of the proposed amendment was to "delay and shame" those seeking an abortion. Independent TD Carol Nolan rejected the assertion that the amendment was misogynistic. She also accused some in the committee room of laughing during discussions on an earlier amendment. Independent TD Mattie McGrath said there was no question of women being forced to undergo an ultrasound. However, Minister for Health Simon Harris said the effect of the amendment as proposed would be to make it mandatory for every woman to undergo an ultrasound, and sign it, even if she did not have to see the screen. He added that the penalty for the doctor who failed to perform this was a prison term of four years. The amendment was defeated by eight votes to zero. Earlier, an amendment proposed by anti-abortion TDs to provide pain relief to the unborn in the event of a termination was also defeated. Kerry TD Michael Healy Rae said if he lived forever, he would not be able to understand why anyone would object to this. Suspended Sinn Féin TD Peadar Tóibín said it was amazing that they had to flight for pain relief in this situation, while his former party colleague Ms Nolan said it was 'beyond belief'. Minister Harris said it was up to clinicians to decide about the administration of anaesthetic, and this should not be legislated for. He said it was not the job of this bill to regulate obstetrics. The amendment was defeated by seven votes against, with one abstention. 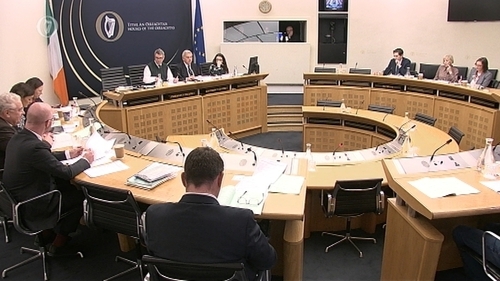 There were further heated exchanges as the committee discussed an amendment relating to the disposal of the foetal remains following surgical abortions. Mr McGrath said there is currently "no provision in the bill for treating the remains of aborted babies with respect or dignity" and "horrendous abuses" had occurred in other countries where such protections did not exist. He said their amendment was clearly referring to surgical abortions, and any proposed penalties referred to clinicians and facilities and not the women themselves. However, Fine Gael TD Kate O'Connell told the committee that the amendment would cover those who had suffered miscarriages. "If find it offensive as a woman who has been in this situation. I don't need to inform anybody what I have done with my foetal remains. I don't want to inform the minister. I don't want it in legislation and I most certainly don't people in this house prescribing what I should do with my used maternity pads, my soiled bed sheets, my bath sheets," Ms O'Connell said. Minister Harris said the amendment was unnecessary and from speaking to those who had terminations for medical reasons, they "knew exactly how to care with compassion for their beloved baby who could not survive". He said the unintended consequences is that the amendment would apply across all sections of the bill. That should not be at the expense of "unwitting patients" who are entitled to expect they will be dealt with by registered medical practitioners who are not lacking in the basic competencies required of a doctor in the hospital, he said. He hoped the authorities involved in recruitment of junior hospital doctors will review recruitment procedures and particularly the conduct of interviews so as to ensure what happened in this case will not recur, the judge added. The committee has completed a lengthy discussion on the three-day waiting period which is contained in the Bill. The legislation includes a provision of three days between the time a woman is certified as pregnant and the termination of pregnancy. A number of TDs tabled an amendment which sought to delete the three-day wait from the legislation; however the general view at the committee was that people who voted in the referendum last May were mindful of the clause and therefore it should be reflected in the legislation. There was criticism over the term "cooling off period" being used to describe the three-day wait. Sinn Féin’s Louise O'Reilly described it as something one would associate with insurance; while the Solidarity-People Before Profit TD Bríd Smith said it suggested overheating in a woman’s head, her body and in decision making. Fine Gael TD Kate O'Connell said the term had a sense of women being irrational and incapable of making decisions. A number of deputies expressed concern that women will require two appointments with their GPs, the first for certification the second for a medical termination, as practices are already under huge pressure. The Chairperson of the committee, Deputy Michael Harty, who is a GP, said in his view it would take three visits to a GP, a third as a follow-up appointment following the procedure. Minister Harris agreed with that. He told the committee that doctors will be dispensing the pills, so women will not require a prescription to go to a pharmacy. There were also questions over whether "the clock starts ticking" on the three day period once a woman makes an appointment by phone for example, or when she first sees the doctor. Mr Harris said that issue would need to be teased out, and he pointed to section 18 (H) of the Interpretation Act which outlines how periods of time are dealt with. He said on the basis of that act, if a woman sees her doctor at 5pm on a Monday, that includes Monday as part of the three-day period. Mr Harris said there were operational issues in relation to how the three day period would work and when the clock starts, and he requested that he work with deputies between committee and report stage to work on the issue legally and operationally. The amendment was withdrawn by Deputy Clare Daly with a view to returning to it at Report Stage. Terminations between nine and 12 weeks are likely to take place in a hospital setting according to Minister Harris. He said while there is no specific indication needed for termination up to 12 weeks, best medical practice is that a woman gets referred to a maternity hospital up to 9 weeks. He said a model of care is currently being devised by the Irish College of General Practitioners, the Institute of Obstetricians and Gynaecologists and the Royal College of Physicians. Minister Harris told the Committee that "really good progress" was being made on referral pathways and he was cautiously optimistic that the clinical guidelines and models of care would be agreed by the end of the month. The Committee has also briefly discussed conscientious objection, however amendments dealing solely with the issue will be considered in later amendments. Ms Coppinger said in principle people feel they should be able to conscientiously object. However, she said the emphasis in the debate over the abortion legislation appeared to centre on health professionals rather than the impact on women if they do object. The Minister for Health said talking about conscientious objection solely impacting the Doctor needed to stop. Mr Harris said that outside the legislation a 24-hour helpline is in the process of being set up, which will be "manned or womaned" by nurses, midwives and councillors to ensure it will also be a source of information for women seeking to find the nearest services. Minister Harris said while it was not mandatory for doctors to sign up for their information to be given to that helpline, a number of them willing to give their details had come forward. Mr Tóibín said limits to the rights to one person is where they infringe on the rights of others. He said that to force medical practitioners into an act of culpability was not reasonable. There were further heated exchanges at the committee as they discussed an amendment relating to the disposal of the fetal remains following surgical abortions. Independent TD Mattie McGrath said there is currently "no provision in the bill for treating the remains of aborted babies with respect or dignity" and "horrendous abuses" had occurred in other countries where such protections did not exist. He said that their amendment was clearly referring to surgical abortions, and any proposed penalties referred to clinicians and facilities and not the women themselves. "If find it offensive as a woman who has been in this situation. I don't to inform anybody what I have done with my fetal remains. I don't want to inform the minister. I don't want it in legislation and I most certainly don't people in this house prescribing what I should do with my used maternity pads, my soiled bed sheets, my bath sheets," Ms O'Connell said. He said the unintended consequence is that the amendment would apply across all sections of the bill. The second day of Committee stage consideration over the Regulation of Termination of Pregnancy Bill has now ended for the day. The Select Committee on Health will meet again tomorrow afternoon to discuss the remaining amendments. Just over 30 out of 180 amendments that have been tabled are left to be discussed. Meanwhile, a group of GPs have called on the Taoiseach to intervene in addressing what they have called the "emerging crisis" regarding GP-led abortion services. At a press conference this afternoon they pointed out that over the last fortnight, 640 GPs signed a petition raising concerns about the Government's plan to press ahead with the service. They said they were also seeking a meeting with the Fianna Fáil Leader Michael Martin to discuss their concerns. The group says hundreds of GPs are demanding answers and are "not prepared to be given the runaround any longer". They say the impasse has been brought about by the Health Minister's refusal to acknowledge the depth of feeling among those who are expected to run the service. In a statement the group said many GPs on the ground do not believe General Practice is the appropriate setting in which to deliver abortion because of the lack of capacity in what is an already overstretched environment.